How many eggs exactly does it take to make a great cake? In a traditional 9-inch, two-layer American butter cake, four eggs seem to be the typical number found in most recipes, but other butter cake recipes call for anywhere from 2 to 6 eggs. So what number of eggs is really best? Structure – Eggs are a major structure provider and give a cake firmness, lightness and stability. Aeration – Beaten eggs help to incorporate air into a cake batter and therefore aid in leavening. Emulsification – Emulsifiers in eggs bring fats and liquids together into a smooth batter, allowing for a moist cake that does not seem greasy. Flavor – Eggs play a significant role in the final taste profile of a cake. Color – The golden hue of egg yolks adds soft yellow pigmentation to both batter and cake. Moisture – Eggs are 75 percent liquid which can thin a batter a great deal. Fat Provision – Egg yolks are a good source of fat which can contribute to moistness and tenderness to the cake. Knowing all of the facts about the functions of eggs in cake, it seems like it would be easy to determine how adding or subtracting a couple of eggs from a recipe would affect the final cake product; but unfortunately it is difficult to say which roles are the most significant and how other ingredients, with cross-over jobs, react when eggs are added or taken away. To get a real feel for what will happen we have to move beyond theory and into the oven. Let’s take a look at what actually happens when you disrupt the egg balance in a cake recipe. I baked 5 eight-inch cake layers, each with a different number of eggs added, in order to get a feel for how egg volume variation contributes to changes in the overall cake. 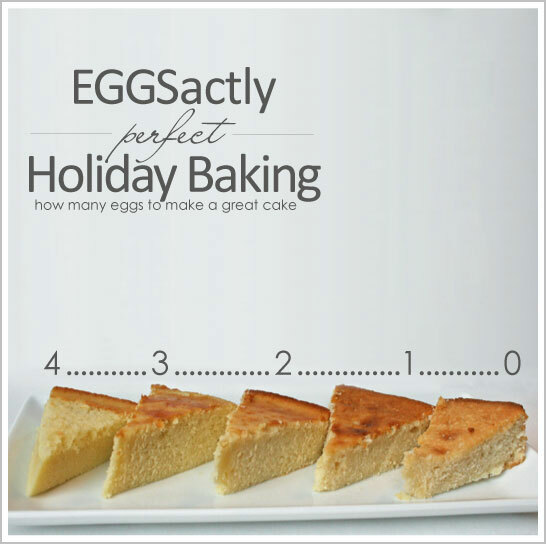 Each cake layer received 0, 1, 2, 3 or 4 eggs (approximately equivalent to a cake recipe with 0, 3, 6, 9 or 12 eggs). Differences were noticeable immediately after the batters were mixed. The eggless batter was extremely thick in consistency and very pale in color while the 4-egg cake was more golden and thinner in consistency. Once baked, taste was also a factor in the differences between the egg-varying cake layers. The layer with no eggs had a noticeable raw flour taste and was excessively sweet. The cake layer with four eggs was markedly eggy tasting like a baked custard or bread pudding. All three of the moderately-egged layers were pleasant tasting. The most significant variance between the layers was their structure. The no-egg layer was short, dense and compact and had so little structural integrity I could barely remove a piece from the cake without if falling apart. The one-egg layer was still rather dense and compact but held together when cut. The two-egg cake layer was greater height and lighter texture with even more structural strength. The three-egg layer was even taller and lighter than the two-egg cake, but the egg structure was reaching the limits of its usefulness and the cake began to take on a slightly spongy texture. The four-egg layer was short, dense and rubbery (if you have ever had a génoise or chiffon cake fall you will know exactly what I am talking about). Overall, changing the number of eggs in your cake recipe can alter the properties of your cake. Too few eggs will yield a cake that is overly compact and doesn’t hold together will. 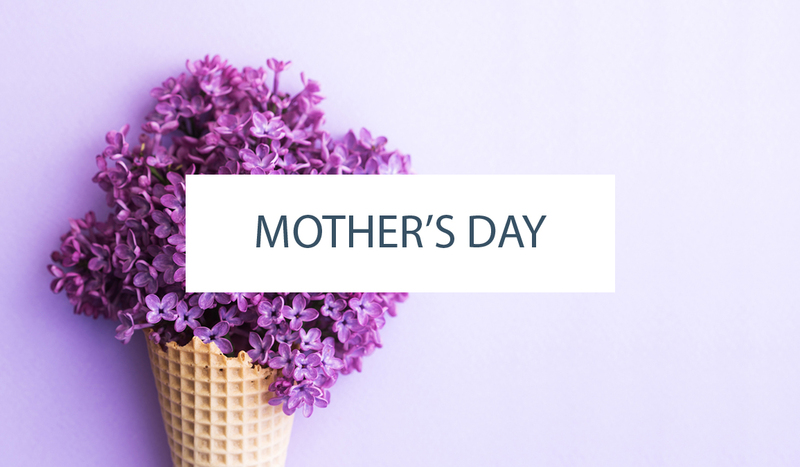 Too many eggs can leave you with a spongy or rubbery mess. 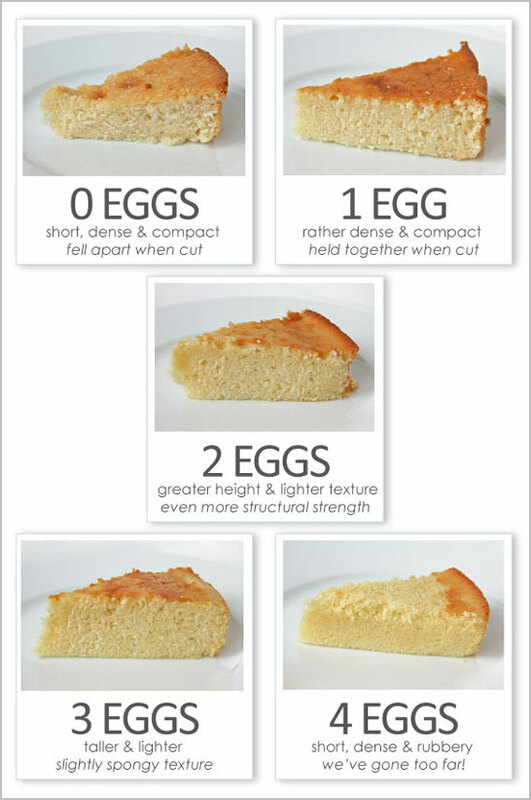 But egg volumes can be manipulated to lighten the texture of a cake or add strength to a cake that needs to be carved. Try varying the number of eggs in your favorite recipe to determine “eggsactly” what works for you. This is a great comparison of variations of a traditional recipe and I can’t criticize your results because they seem quite accurate. As a vegan baker, I know it is possible to make a lovely cake (similar to your 2 egg cake) by using the right recipe, aerating the batter well and immediately placing it in the oven. Thanks for your experimenting… the science of baking is enlightening and TASTY! wow who would have thought? great info. Love a lesson in cake chemistry and this one is as entertaining as it is informative. Thanks for enlightening us! What about the volume of the eggs? Extra Large, Large, Medium, Small. The reason I ask: I must use duck eggs. The are considerably larger in volume than the chicken egg. So would you use the same number of eggs given that the volume is greater? Or decrease because a chicken egg is usually about 1/4 cup while a duck egg is usually 1/3 cup in volume? 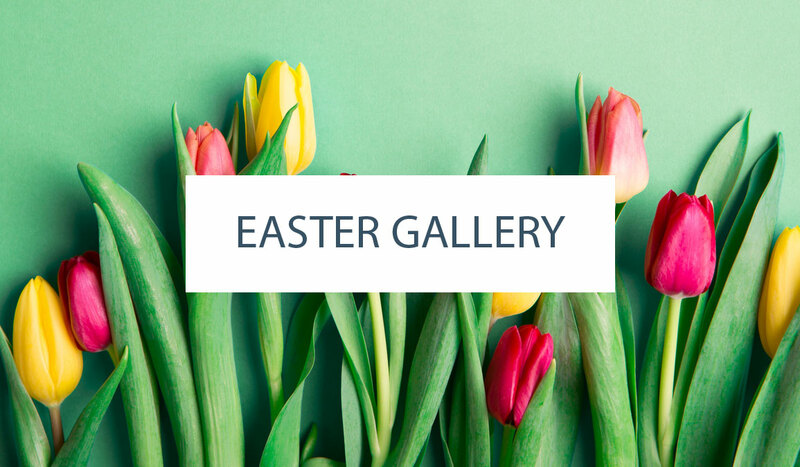 Have you tried weighing your eggs in their shells then using the same weight in butter sugar and flour, makes for an eggcellent Victoria sponge. Really interesting and useful information!! I am wondering if you accounted for differences in liquid volume as well. For example, if 1 egg is about 1/4 cup then the 4 egg cake would have a 1 cup liquid volume whereas the 1 egg cake would have only 1/4 cup. If and how did you account for this difference? How does this work with egg substitute powder (which when mixed with a small amount of water, is supposed to be a vegan egg alternative in baking)? It says on the packet that for most recipes, you don’t even need to add water, so do you know if altering the amount of the powder will have similar results? Thank you, I try to learn as much as I can about eggs. I tried something I had seen on pinterest the other day. They used an extra egg in a boxed cake mix, with melted butter instead of oil (and doubled the amount), and used milk instead of water. The batter was fluffier & more like a frosting, but when I took it out of the oven, all of my cupcakes fell. So disheartening to see all of those little cupcakes with depressions in the center. Sometimes it is best to stick with original recipes, but experimenting is fun and can sometimes create something new & wonderful. Curious about the different properties of whites vs. yolks in baking. Any insight? I haven’t done experimentation yet, but from what I have heard/researched, the yolks add moisture while the whites dry things out (when in excess). The yolks help emulsify ingredients, while the whites help with structure and rising. I think both work as binders, but imagine the whites have a stronger binding effect. … If only we were all rich and could afford to do more experimenting!! I have done the whites vs. yolks experiment and the whites cake is fluffier but less flavorful than a whole egg cake. The yolk cake is very rich in flavor but dense; it doesn’t have the structural proteins to hold up the heavy ingredients. I hope this helps. As a scientist, I am ashamed to admit I never thought to experiment with the amount of eggs in my baking. I’m lucky you were here to do the l-egg-work for me (geddit? I crack myself up. Crack! XD). This is a great post. And I would apologise for my awful puns but considering the title of this post, I reckon I’m forgiven! Ha! No, I probably need to apologize for all of my puns. I do love a witty pun… probably a little too much. Thanks for reading and for your feedback! Summer did such a wonderful job on this experiment. I’m looking forward to a new one she’s working on for us now! This is a great article! I’m often curious about the practical chemistry of baking…recently worked on converting cookies to muffins. Thanks for demystifying eggs. When you baked these, how much flour did you use? Did you use oil or butter?